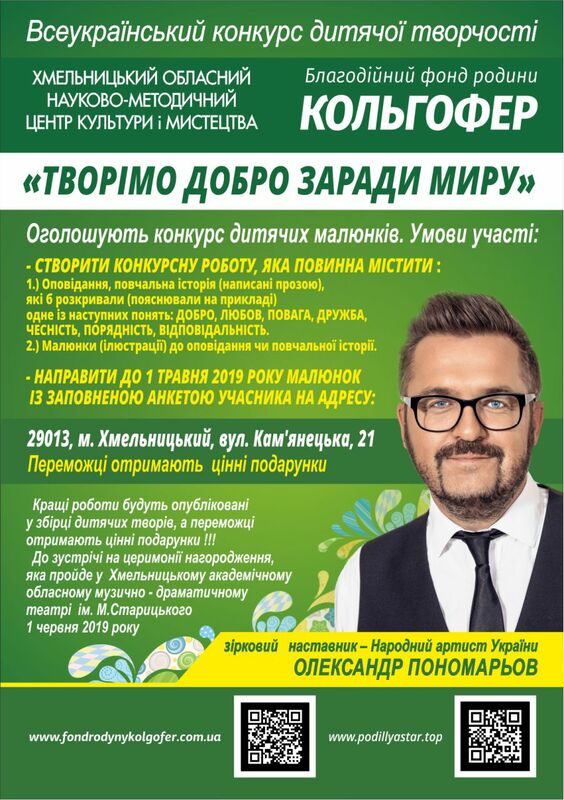 Pressroom | "Fund family Kolhofer"
In 2019 the Khmelnytsky Regional Scientific-Methodical Center of Culture and Arts and the Charitable Foundation of Kolgofer’s Family will host the All-Ukrainian Children's Creativity Contest "Let's Create Good for the Sake of Peace". The days at Letychiv were surprisingly noisy, fun and festive. So the 110th anniversary of its work was celebrated by the main local school. In honor of the jubilee and its dedicated workers in a small town, a real celebration with dancing, singing and the river of sincere wishes unfolded. Fantastic sounds of world melodies conquered the gates in the evening of Friday in the walls of the Khmelnitsky Philharmonic. For lovers of classics, this is not just another portion of spiritual enrichment, but also the opportunity to see the work live without exaggeration, conductor of the international level - Lorenzo Castriota. The countdown of days to the New Year has already begun, so the most anticipated holiday of both small and adults is not far off. The glow of colorful lights, the elegant New Year's beauty and the continuous rustle of candy wrappers are an integral attribute of the main winter holiday. Despite the overcast weather and the not-too-bad day, the weekend in Golovintsy was warm, fun and really festive. Indeed, it was in the beginning of November that people celebrated the Village Day and the Temple Holiday.